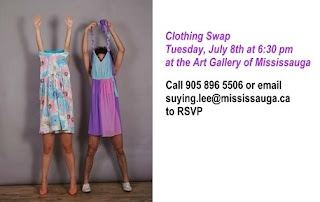 In honour of our first ever Artist-in-Residence, Christina Kolozsvary, from Syracuse, New York, the Gallery will be hosting our first ever Clothing Swap! What’s a Clothing Swap? A Clothing Swap is an event where the participants trade their pre-loved clothes, shoes and accessories. It’s a chance to clean out your closet, get a new wardrobe and meet the artist. Christina Kolozsavary is taking up a short residency in Mississauga this summer in anticipation of an exhibition Couch surfing in Mississauga/Couch surfing in Syracuse. The exhibition will feature work created by Kolzsavary in response to her stay in Mississauga. Likewise, Mississauga artist, Alison Kobayashi will create work for the exhibition during a residency in Syracuse. Couch surfing in Mississauga/Couch surfing in Syracuse will be on exhibit February 5 to March 22, 2009 and will also be exhibited in Syracuse. How do artists in the formative stages of their careers assimilate location and residential identity into their work? This exchange has been created to consider Mississauga and its identity as a city-suburb and cultural producer. A highly diverse, densely populated city, Mississauga’s identity is often overshadowed by its closest urban neighbour, Toronto. Syracuse shares some of Mississauga’s identity struggles and each of us, a few uniquely our own. The Art Gallery of Mississauga wishes to thank Emily Vey Duke & Cooper Battersby, Couch surfing Residency co-curators and Séamus Kealy, Curator, Blackwood Gallery, University of Toronto at Mississauga for provision of residence space.